Traditionally land artists eradicate people from their work, people don't seem to be natural enough to be part of their landscape. PaulMart want to include people in a land art piece. People will be the central focus in this form of land art. This change in focus will not require much physical manipulation of existing projects. The project closest to PaulMart's proposal is Walter de Maria's Lightning Field. The artist controls lightning via a grid of 400 stainless steel rods, but as it is so far removed from any settlement his weather only affects those who make the pilgrimage to see it. PaulMart will manipulate the rainbow in the same way. But instead of a grand egotistical/existential gesture in an uninhabited desert, PaulMart's piece will take place in front of an audience. In terms of scale and subject matter Olafur Eliasson's Weather Project is land art - albeit artificial, indoor land art (the artistic equivalent of a plastic Christmas tree). Yet its popularity with the general public turned it into a regular lunch break venue, a grand dinner hall for the local office worker. PaulMart's piece will fuse the majesty of traditional land art with the human sentiment of the Weather Project. It will be delivered to the people who are often overlooked when it comes to contemporary art. A piece of inspirational land art would suit these people down to the ground as sublime nature is right up their street - a mainstay of their existence. 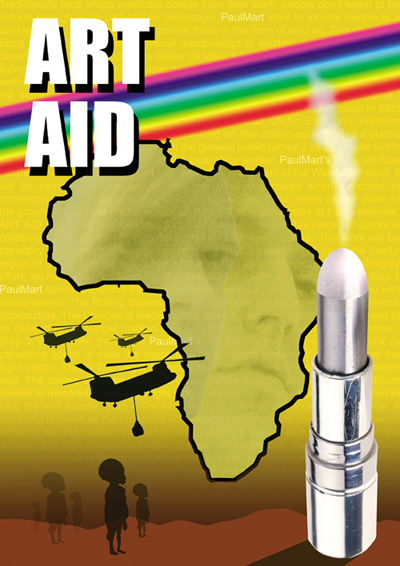 ART AID is needed for those less fortunate than ourselves. This piece will combine collaborative performance, auto-destruction and a water feature. The work will be transitory and located wherever needed. The first installation will be in the Darfur region of Sudan. The selfish nature of the artist must be jettisoned for this almighty effort; we must strain to, quite literally, drop our hard work all over the desert. PaulMart descend towards the targeted settlement in a Chinook helicopter fitted with loudspeakers, The Rolling Stones She's a Rainbow will be playing as the Chinook approaches. The Chinook is loaded with a laser-guided package that will descend to its desired target (target marked by local militia to retain the element of surprise). When over the target PaulMart push the package out of the Chinook (a parachute opens to ease the descent). The guidance system kicks in to adjust the flight vector. The target becomes clear as the package closes in - the water well. The casing and parachute are discarded as it drops into position. A platinum obelisk is revealed, blindingly bright in the African sun. The bottom is engineered to plug the well exactly. The obelisk fits in the well and locks itself in place. A humming is heard as the proboscis like water pump descends into the well (unseen). When it hits the bottom the pump automatically turns on sucking to water to the surface. It is then pressurised within the body of the obelisk. Once the water pressure reaches optimum level a fine mist of water is discharged from the top of the piece. The sunlight catches the water vapour and forms a perfect rainbow over the settlement. The water runs out (time dependant on volume of water in well). Militia collect the obelisk to be re-packaged and prepared for its next show.